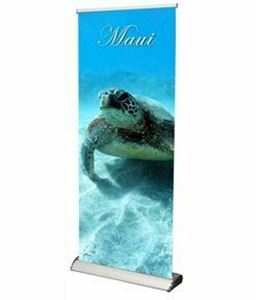 It is quick and simple to use and holds 33.5"w x 80"h banner (with a 6" bottom bleed) attached by clamp bar. Banner is attahched to the top clamp bar on top and double-taped on the bottom. It easily portable in black carry bag (included). The stand come with 1 years warranty.